Admire the beauty and intricacy of book art in the Alice C. Sabatini Gallery’s In the Studio exhibit March 23 through May 6. The exhibit will highlight book artists Julie Chen, Fred Hagstrom and Amos Paul Kennedy Jr. with recreations of their studios that provide a glimpse of how they work. Visitors will also learn how paper is made and get hands-on experience in the history of bookbinding. “Artists’ books are a tricky thing to explain, so we’re giving our visitors the opportunity for a close-up view of the books, and the materials and processes the artists use to create them,” said art librarian Brea Black. Julie Chen combines the crafts of letterpress printing and hand bookbinding with modern technologies like photopolymer plates and laser cutting. She founded Flying Fish Press in 1987 to publish her own limited-edition artists’ books. 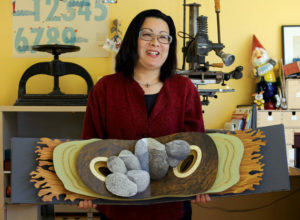 Chen is also a professor of book art at Mills College in Oakland, California. “The idea of giving order to personal experience through the use of mapping, charting and numbering is an important underlying theme that runs through much of my work,” said Chen. Fred Hagstrom is a print and book artist whose work touches on a broad range of social issues. He is especially interested in the connections between art, culture and the natural world. 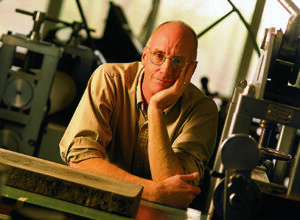 Hagstrom is an art professor at Carleton College in Northfield, Minnesota. “I believe that art should be a part of people’s lives and that it has the power to change the way we view the world,” said Hagstrom. Amos Paul Kennedy Jr. is best known for his social and politically driven broadsides. He believes everyone should have access to art. Kennedy was recognized for his artistic accomplishments and innovative work with a 2015 United States Artists’ Glasgow Fellowship. 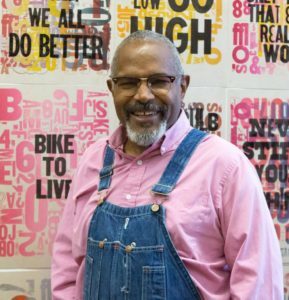 He currently runs Kennedy Prints in Detroit, Michigan. 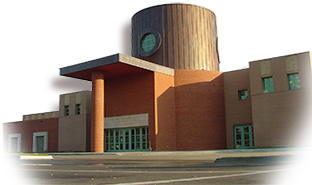 If you would like to stay informed of upcoming exhibits and art programs at the library, please join our email list. Brea Black is the Art Librarian and Book Arts Curator in the Alice C. Sabatini Gallery. Her favorite thing is to share the wonderful world of artists' books with the community. She also leads the Arts & Crafts team and teaches workshops on bookmaking, altered books, and a variety of crafty topics. Posted in Art and tagged alice c. sabatini gallery, art, book art, gallery-main, sabatini gallery.